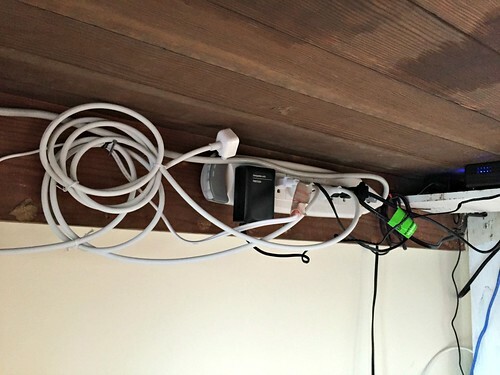 One of my least favorite types of visual clutter is CORD CLUTTER — second only to PAPER CLUTTER, which I really detest! I hate the look of cords hanging all over the place, jumbled up, collecting dust, waiting to be pulled or tripped over, or frayed by the vacuum, or accidentally unplugged. Because of this, I’ve always been very particular about keeping all our electronic cords up off the floor, usually concealed in some form or fashion. 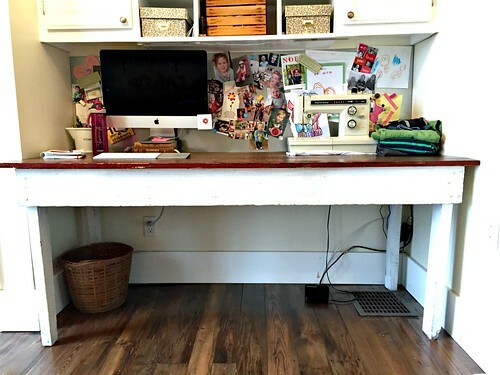 One of the most “cord congested” area in our home is our office — specifically the desk area. You can’t see it, but we have LOTS of cords hidden under that desk! 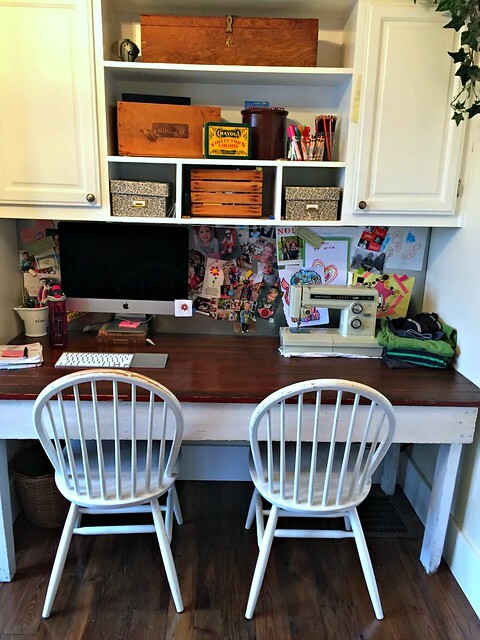 It COULD be a huge tangled mess of cords hanging all over the place, but due to my super simple organizational system, you can’t see anything but my sewing machine peddle and the cable cord running up to the “hidden” modem — even when we remove the chairs! I set this system up years and years ago, but due to installing a new modem and router last weekend, I realized it was probably something I should share (or maybe re-share) on my blog. It’s definitely not a “pretty” system with decorative labels or color-coded twist-ties, but it works SO well and is super easy to set up. A few nails or hooks to keep cords elevated. Once you have the necessary supplies, the “installation” is pretty straight-forward. 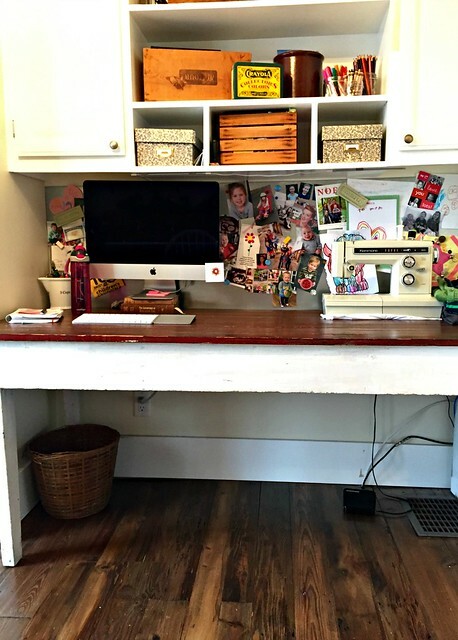 Mount the power strip under the desk (or to the wall behind the desk). Plug all necessary cords into the power strip. Once the cords are plugged in, use twist ties or rubber bands to secure the extra length of the cord as close to the power strip as possible. 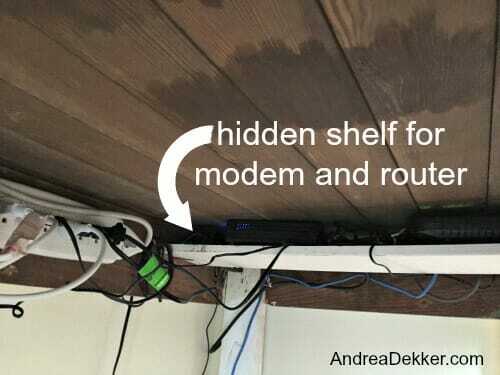 Add a shelf or brackets as necessary to hold larger items like modems, routers, power blocks, etc. Stand back and enjoy the clutter-free floor! 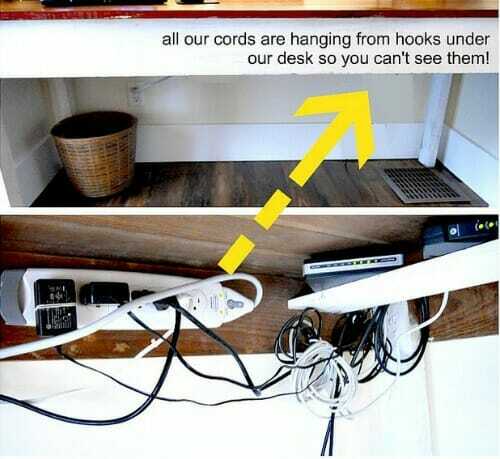 Like I mentioned above, I KNOW there are more attractive and more professional ways of concealing cord clutter — but considering this option was completely free AND has been working well for us for 8 years now, I think it’s worth sharing! 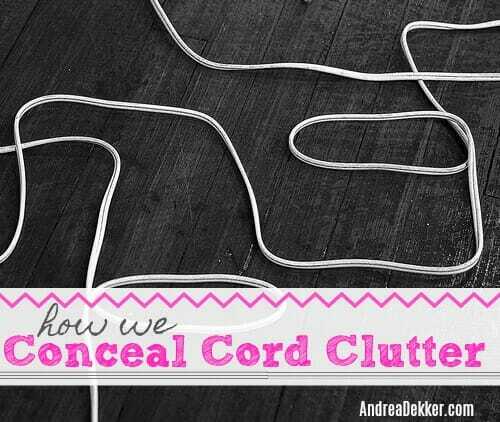 How do YOU conceal your cord clutter? Yes... We Have a WHITE Couch! This is perfect! There is nothing I hate more than having a bunch of cords on the floor. Great ideas! Hope to use them in our new home! Wondering if you could give more info about your “booster” for your internet signal? What is it? Brand? How does it connect? Etc. Thanks! sorry, I know nothing about this. Dave set it up so we can get a better internet signal to out out building. We wouldn’t need it if it were just for our house! Just wanted to say hi! I heard your name for the first time today via the Organize 365 podcast. I just found Organize 365 and have been catching up on episodes and loved hearing your interview. My boys are 3 and 1 so I look forward to digging into your blog and learning some of your tips! My dogroom has a similar system to yours. In the grooming area a friend’s husband put in an extra outlet, since the only layout that worked blocked the existing one. I have the clipper and grinder cords hung on hooks, permanently plugged in to a surge protector that is attached to the shelving. I can drop them when I’m grooming and need to get clear around my dog, but in the meantime they’re not collecting dust and dog hair, and they’re out of reach of nibbling teeth. The phone charger and CD player sit on a metal cart, so their cords hang on magnetic hooks, secured with binder clips. In the living room I stole an idea from Young House Love and drilled about 50 large air holes in a photo box, and cut a hole in the back. All the cords for my laptop, router, and lamp are stuffed in there, along with the surge protector and router. I watched it like a hawk initially, but the airflow is good, and nothing has ever come close to overheating, even in our lovely Northern Indiana summers with no AC. Also dog-proof. In the bedroom the cords for the DVD player and TV are gathered up on Command hooks, and the serge protector is Command-stripped to the dresser, since it’s an antique and I didn’t want to drill hooks. Yeah, I really loathe cord clutter, and also consider it a safety hazard with puppies–they’re as curious as toddlers, and their teeth are sharper. wow — these are such great ideas. Thanks for sharing Margaret! I just tackled ours last week. We just mounted our television for the first time ever. 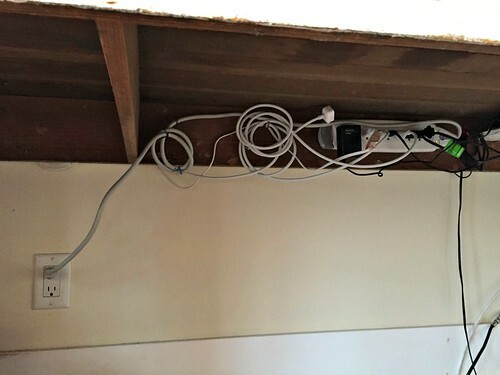 I didn’t want to have the cables hidden in the walls because ours are plaster in this old house. So I bought a paintable strip to conceal the five inches of wires running down from the tv to the buffet. It looks really good painted! Then for the rest I did what you did. I mounted the power strip on the wall behind the buffet, and then zip tied the rest of the millions of wires up. It looks great! I love your shelf idea! Keeping that one filed for future reference! good ideas — thanks for sharing Amy!